Hedge Panel 24" Tall x 48" Wide x 6" Thick Foam Display Prop - Dino Rentos Studios, INC. This is a single Hedge Panel. Use by itself or with the Stone Columns to build a topiary fence. Perfect for photographers, trade shows, retail displays, stage and theater, and parties. 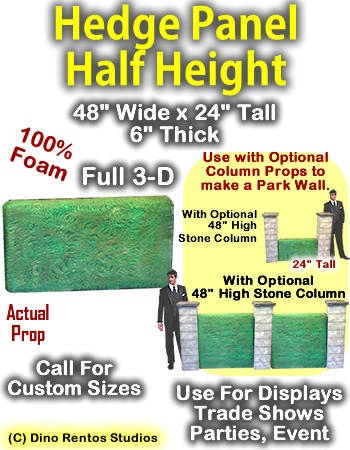 See our complete set of Stone Columns and Hedge Panel Bush Walls.